Luzerne County Community College's 2017-2021 Strategic Plan, Building on 50 Years of Student Success and Educational Excellence, is the culmination of an 18 month planning cycle of conducting research, interpreting data, analyzing trends and assessing results of past College initiatives. 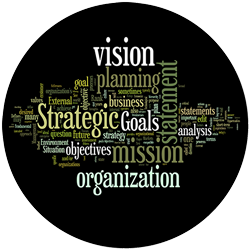 A Strategic Plan Steering Committee was formed with a charge to evaluate relevant data, utilize a collaborative and consultative process to identify plan goals and realistically assess currently available and potential future resources. Input from internal and external stakeholders was welcomed in various forums including focus groups, planning retreats, committee meetings, interviews and open discussion opportunities. The inclusive process allowed for health debate of issues and diversity of perspective. The Strategic Plan serves as a catalyst for update to all College plans to ensure goals are synced and institutional priorities are identified to ensure achievement of the College's Mission. Specifically, the Enrollment Management Plan, Academic Plan, Technology Plan, Facilities Master Plan, Marketing Plan and Advancement Plan identify initiatives necessary to achieve strategic and operational goals while outlining a firm link to the budget and resource allocation process. Objective 1.1 - Expand LCCC's service area to include presence in surrounding geographic areas as well as outreach to underserved areas of existing markets. Objective 1.2 - Maintain existing LCCC market share through expanded recruitment efforts in targeted subpopulations. Objective 1.3 - Expand marketing capability in response to changing communication styles, expanded service regions and increased competition. Objective 2.1 - Support the accomplishments of student goals through collaborative retention efforts by all institutional divisions and departments. Objective 2.2 - Align existing services to population needs by providing equitable services at Dedicated Centers, and greater access to Main Campus programs and services. Objective 2.3 - Enhance linkages between academic programs and career and industries. Objective 3.1 - Increase student access to college programs through provision of innovative course schedules, varied delivery methods, and offerings in optimal locations. Objective 3.2 - Align program offerings to meet the changing needs of the labor market, including new program development. Objective 3.3 - Enhance teaching and learning through the use of a comprehensive, systematic assessment process where student learning data is used to improve curriculum and instruction. Objective 3.4 - Implement best practices for maintaining state-of-the-art curriculum, equipment, and facilities guided by input from industry and four-year transfer institutions. Objective 4.1 - Integrate all College plans with the Strategic Plan and College Budget to ensure compliance with the Middle States Standards for Accreditation. Objective 4.2 - Ensure a Culture of Assessment by utilizing data-driven decision making for planning and utilizing assessment data for continuous improvement. Objective 4.3 - Support professional development for faculty and staff creating a culture of collaboration and cooperation and develop a succession plan to sustain effective and efficient College functions at all levels in response to change. Objective 4.4 - Ensure consistent compliance with institutional policy and procedures as well as federal, state and local requirements. Objective 4.5 - Strengthen the institution through development of a comprehensive financial plan and efficient and effective allocation and management of resources to support implementation of all College plans (Strategic Plan, Academic Plan, Enrollment Management Plan, Facilities Master Plan, Financial Plan/Budget, Safety Plan, and Technology Replacement Plan) and pursue opportunities for alternative funding and increased revenue. Objective 5.1 - Expand and enhance strategic engagement with external stakeholders to positively impact the quality of life in the region. Objective 5.2 - Support and encourage community members to actively participate in diverse activities and events at all campus locations through varied offerings, full utilization of College facilities and continued communication of available opportunities.